Working Capital cycle is an important ratio which tells us how many times in a year is a company able to churn its inventory to make goods and generate cash for their business!!!. Now would you not like to invest in a company which does not need to take much debt as their goods get sold as soon as it gets manufactured. I bet you would!!!. That means the company keeps on receiving back the money from sales of its goods and uses the same cash for its inventory purchase thus hardly requiring any debt financing. These companies are investors favorite. The time that a business takes to churn its Assets and Liabilities to generate cash for the business is known as the working capital cycle. The Net Current Assets and the Current liabilities, a component of the balance sheet; are used to maneuver Working capital requirement. It is used to understand the Liquidity and efficiency of the company. The more the working capital cycle the lesser is the chances of the generation of quick cash and the lesser the working capital cycle the higher the turnover ratio thus generating more cash for the business. Hence, the outside debt or loan requirement to become lesser, raising the efficiency quotient of the business. Sometimes natural calamity like Tsunami or Earthquake or an unforeseen calamity like flood or government policies or geopolitical turmoil or economic implications or macros of different countries impacts WCC for a shorter period of time but the effect can be long-lived. If the management is dynamic then it will try to minimize the effect on its working capital cycle and increase cash flow generation. If the Current Assets exceed Current liabilities then the firm is said to have a positive working capital cycle and if the Current Assets is less than the Current Liabilities then the firm is expected to have a negative working capital cycle. Shorter is the working capital cycle higher is the free cash flow generation and higher is the liquidity of a company. Components impacting WCC is debtors, creditors, stock and Free Cash. Now let’s understand in an example what exactly does WCC means. Payable days means the days required to manufacture a product after purchasing the inventory bought on credit this is shown under Accounts Payable. Now goods sold may not receive instant payment thus some payment may be received later thus these are shown under Accounts Receivable. Now Inventory days means the days required to turn inventory into sales. Now Suppose the Inventory is bought on credit of 45 days, the company sells its manufactured goods in 40 days and the company receives payments from the creditors in 15 days. Thus WCC = 40days +15days – 45days =10 days. Therefore the company receives back its cash within 10 days of selling its Inventory. Nowadays we don’t have to calculate the Working Capital Cycle on our own. StockEdge gives us WCC of the last five years of any company listed in the stock exchange. We can look and compare the WCC of any company and filter out stocks accordingly. Suppose we want to look at Working capital cycle of Finolex Industries Ltd for the last 5 years than in the Fundamental tab of Finolex Industries Ltd, click on the fundamentals tab, we will get Ratios tab. Then in the Ratios tab click on the Efficiency Ratios, we will get WCC of Finolex Industries Ltd. Working Capital cycle varies from Industry to industry thus stocks under the same industry are comparable. 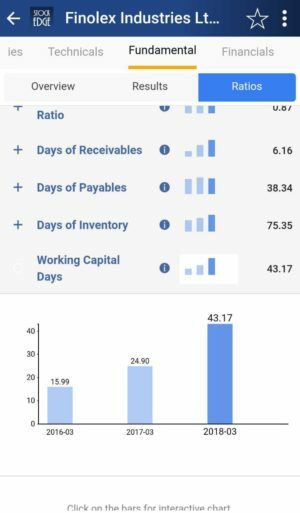 Thus there can be no defined criteria for the working capital cycle but worry not our app gives you in-depth data of five years to analyze the working capital cycle. So wait no more, if you have not subscribed to the stockedge app then subscribe now and avail this data for free. We also have scans available in our premium version which is a paid feature.